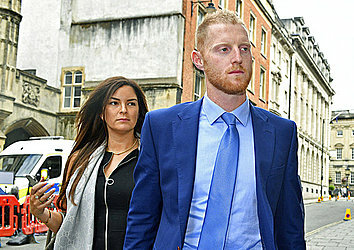 BRISTOL, England (AP) — England cricket player Ben Stokes was found not guilty on Tuesday after saying during his trial he was acting in self-defense when he knocked out two men in a street fight. At Bristol Crown Court, Stokes closed his eyes and then looked up at the conclusion of the case that cost him his role as vice captain of England's national cricket team. Stokes missed England's Ashes tour of Australia because of the incident, but he was still the most expensive overseas recruit in the annual player auction for the Indian Premier League Twenty20 competition this year when the Rajasthan Royals paid $1.95 million. Prosecutors wanted to charge Stokes with two counts of assault over the fracas near a nightclub last year in the southwest English city. But the judge would only allow him to stand trial on another charge which meant the jury had to be satisfied Stokes' fight with two men endangered people nearby. Stokes was cleared in a unanimous verdict. During a night out with England teammates after a match against the West Indies last September, Stokes had at least 10 drinks in the hours before the fight unfolded. A nightclub doorman, who said he was verbally abused by Stokes, said the cricket player also mimicked the mannerisms and voices of two gay men outside the entrance. But further down the street, Stokes said he heard two men directing anti-gay slurs at the duo he had encountered at the club and came to their defense. "I felt under threat by these two and felt I had to do whatever it was to keep myself and others around me safe," Stokes said. "I didn't know, they could be carrying more weapons on them. They could decide to attack me at any time if I was to turn my back on either of these two. At all times I felt under threat from these two." Ryan Ali, whose eye socket was fractured by Stokes, was also found not guilty on Tuesday. Another of the accused men, Ryan Hale, was found not guilty during the trial on the direction of the judge.